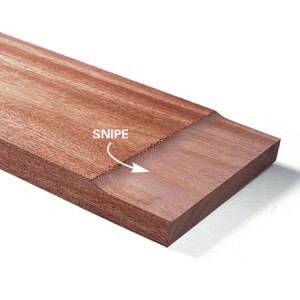 Did you know that a planer which does not give a 95% snipe-free cut is a badly set wood planer? For efficient use of wood planing tools, you must ensure a very accurate setting. Setting up a planer should not make you nervous especially with the tips highlighted in this content. Be careful not to leave the knives on your tool for too long before re-sharpening. This yields poor output. Keep in mind that a dull planer is difficult to use simply because the timbre bounces around rather than yielding a smooth cut. Have you experienced difficulty associated with incorrectly-set knives which results in an inability of the planer to plane smoothly and the planer taking huge scoops out of the end of the work? The beauty of a perfectly working planer lies in perfect blade adjustment. Never assume that it’s correctly set up straight out of the box; handling in transit is capable of knocking the table out of line and thus affect all settings. Correct setup will enable the pinch rollers to successfully maintain pressure on the stock without allowing the board to rise up as it tours through the planer while contacting only one roller. During the operation of the planer you have the cutter table, the feed roller, and the ends of the in-feed or out-feed table all effecting the quality of the cut. These are at least three points of contact to the stock and this is the point where snipe occurrence can occur. That is, during the beginning or end of the cut when there are only two points of contact— the cutter table and the feed roller—leaving the board end free to pivot up or down if the in-feed or out-feed table is unable to apply sufficient upward pressure to the stock. What you will read below are proven stepwise methods of wood planer setup that can eliminate snipe. Sniping is often caused by poor feeding techniques as a result of blades setup too high on the stock. If the blade is too low, the timber will jam as it hits the end of the out-feed table and if the setting is a fraction too low, the cut would taper away and will remain like that no matter the number of passes. You can solve snipe and jam problem through several careful adjustments. Unplug the machine and drop the in-feed table to get it out of the way since all settings must comply relative to the fixed out-feed table. Slacken remaining bolts on the locking wedges. Ensure that you use the short follow-come spanner with the machine to avoid over-tightening and stripping fine threads on locking bolts because you won’t get extra pressure by getting a longer one. You will need to twist the bolt into the wedge prior to removing the whole assembly which will ultimately come out as a unit. 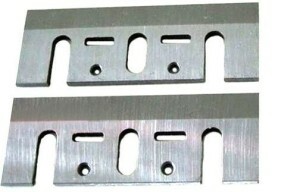 Thin double-edged disposables and the thicker re-sharpenable blades exist. With the disposable blades—double-edged and best for beginners, once the holder is set up, will slot into position without additional effort. Re-sharpenable, though cheaper than fresh disposable blades, will need a reground for a new edge and must be reset each time to justify lost width. No matter your choice of blade, clean the blade slots to remove any trapped shavings. Apply oil or dry lubricant on the wedge-locking screws for ease of rotation without need of spanner. Make sure that the height-adjusters on either end of the wedge are free for adjustment. Substitute a new knife and lock wedge back in the block, fit knife over any locking screws. Tighten up the locking bolts until the knife is secure but loose enough to permit movement as you alter height adjusters. Screw height adjusters to lower the blade and make sure it lines up with the end of the block. Make sure to set height of the blade a little higher than the rear out-feed table. 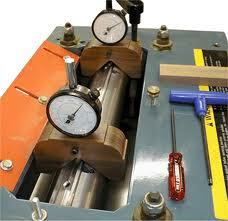 Some of the wood working machines come with settings which often is a plain fitting metal template. Simply wind out the knife, as a friend would say, until it perfectly aligns and bottoms in the notch of the cut-out. By implication, it’s presumed that the rear height hasn’t been changed relative to the cutter block. Unplug the planer; lower the in-feed and out-feed table adjustment screws to enable the tables go below the centre (cutter) table. Then, raise the cutter head assembly and carefully turn the head in such a manner that the blade will hang below the cutter head unit. Position a long lengthy straight edge in the middle of the table and the pinch rollers in the center of the table. Let the cutter head assembly fall until the pinch roller is in firm hold with the edge. Then gradually attune the table adjustment screws until the in-feed as well as the out-feed tables make contact with the base of the straightedge. At this point, let go the pressures from the feed rollers holding the straightedge. And move it to the side of the table and ensure that the in-feed and out-feed tables are in contact with the straightedge. Gently use a wrench while the straightedge is in position to attune the levelling screws up 1/4 beyond the point where the table is in contact with straightedge. Then release the feed rollers, you will see a small gap between the centre table and the bottom level. After this point, ensure that you double check the above two steps. One important thing you need to set up a wood planer is patience, carefulness and frequent practice. But as with any fine woodworking tool setup, precision is the hallmark of excellent master carpentry.